The details of the mysterious mission that Hersheypark has been hinting at have finally been revealed - coming to the park in 2019 is a brand new interactive dark ride named Reese's Cupfusion. The attraction, created by Sally Corporation with design elements by Raven Sun Creative, will feature "state-of-the-art, multi-level game player technology." 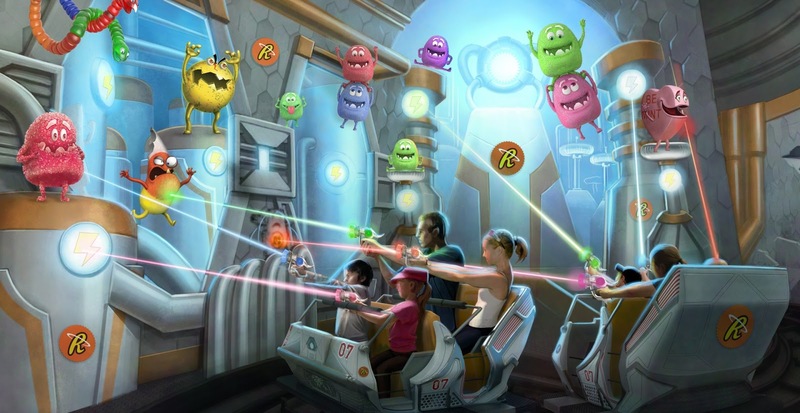 While the park's press release does not directly state that Reese's Cupfusion will replace the park's current interactive dark ride, Reese's Xtreme Cup Challenge, it is believed that it will. The park did confirm that the new attraction will be built in the Founder's Way themed area, and open in Summer 2019. Featuring an interactive experience that combines sight, smell, touch and sound, Reese's Cupfusion will treat riders to an experience that resembles an interactive family game. Riders can earn points several ways, including shooting "spirit beams" from their amplifier as they ride. Visitors will become Reese's Agent Trainees in Reese's Central on the ride, a location that runs on Reese's Spirit via the Crystal Cup, which "collects and amplifies the love of chocolate and peanut butter to create Cupfusion Energy that powers the factory." On the ride agents will protect the Crystal Cup and earn points while doing so, blasting away evil doers like Mint the Merciless and The League of Misfit Candy. Reese's Cupfusion will allow riders as small as 36 inches to ride with a responsible companion, appealing to a wide selection of visitors. For more on the new attraction, including more concept art and a video, check out Hersheypark's website for the new ride.